All the punditry since September 8, when Alexei Navalny won 27% of the Moscow mayoral vote, with a 32% turnout, has missed three unusual poll indicators measured by the Levada Centre. The first is that Prime Minister Dmitry Medvedev’s approval rating has been in steady decline for a year, but it is now at an all-time low — far lower than Medvedev suffered as president during the economic downturn of 2008-2009. The downward trend line may be accelerating for Medvedev. By contrast, the second indicator shows that President Vladimir Putin’s approval rating for the past two years is stable despite the economic downturn, and may now be rising. The third indicator is the remarkable one. This shows that the correlation between the President’s and Prime Minister’s ratings is evaporating, and the gap between them is now growing. 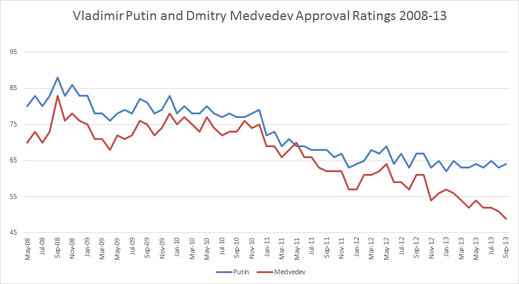 Public approval gains for Putin but dwindles for Medvedev. One-time rival for the presidential succession who was bested by Medvedev in the 2008 race, Sergei Ivanov put his finger this week on what is happening, at least as the political trend is viewed from his present office as chief of the presidential staff. According to Ivanov, there is a stable majority in the Russian electorate which is more or less satisfied with the status quo; this near-silent majority regards Putin as its protector. On the other hand, Navalny has succeeded, at least in Moscow, in having “very efficiently mobilized his own and the entire protest electorate.” Ivanov suggests that taking into account the low turnout for last month’s ballot in Moscow, this mobilization is not significantly larger than Mikhail Prokhorov achieved in Moscow in the presidential election of March 2012. Ivanov didn’t say so, but the implication from the polls is clear. Medvedev is no longer viewed in the electorate as a figure for reform or change in any direction; much less protest or remedy against the corruption, which is the main plank in Navalny’s political platform. Ivanov is also clear on why poor turnout is a bigger problem for Navalny’s political future than his targeting of Putin. “With age,” the 60-year old Ivanov, observed, “I have come to the sad conclusion that it is more comfortable to spend time with cats and dogs than with other people.” This is also the consensus of the 40-plus age group which backs Putin (60) against Medvedev (48), and all younger comers. 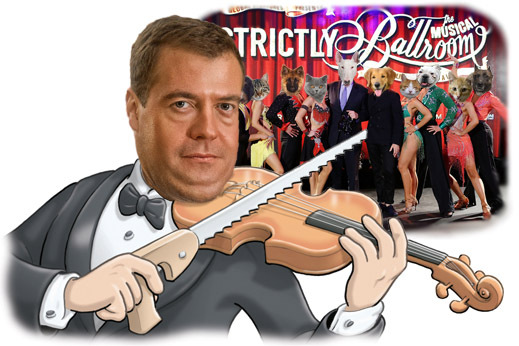 Winning over Medvedev may prove to be easier to achieve than winning over the Russian electorate. This will become clear if the proposal from Federation Council Speaker Valentina Matvienko and other Kremlin supporters is adopted by the United Russia party and a majority of State Duma deputies to reintroduce the Vote-against-all to the national ballot papers. According to the poll evidence, an Against-All vote of 5% — as it was when Boris Yeltsin took the second round of the 1996 election — is most likely to deny the frontrunner in a close presidential election a first-round majority. For Putin, though, that would have been the case in 2000, when he won with 52.9%. However, in 2004, 2008, and 2012 the winning pluralities were 71.3%, 70.3%, and 63.6%, respectively. The head of the Department of Political Studies at the All-Russia Centre for the Study of Public Opinion (VTsIOM), Stepan Lvov, says that in his organization’s polling there has been no measurement of the “Against All” option since it was eliminated by legislation in 2006. He added that the “Spoiled Ballot” option, which was available in 2007 and 2008, was not comparable to the “Against All” ballot choice. The Levada Centre in Moscow has conducted polls to gauge what would happen if the Against All option been available on the ballot for voters to choose. A report by Levada, issued on March 22, 2012, two weeks after the actual balloting, concluded that Putin would have failed to hold a majority in the first round. From the official count of 63.6%, Putin’s score would have dropped to 46.8%. But then each of the other presidential candidates would have lost too, though their loss margins are not the same. If on the ballot for the March 4, 2012, presidential election there had been the option, “against all,” how would you have voted? Putin’s score would have been cut by the Against-Alls by 23%; the Communist Party candidate Gennady Zyuganov, by 34%; Mikhail Prokhorov, by 25%; Sergei Mironov of the Fair Russia party, by 46%. Vladimir Zhirinovsky, the Liberal Democratic Party of Russia candidate, would have lost least, by 4%. 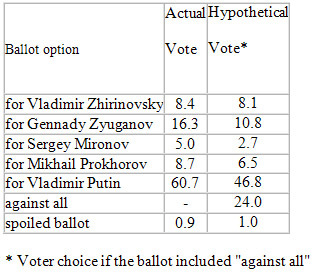 A commentary on these results by the Levada Centre indicates that in aggregate, had voters had the option of selecting the Against All option, they would have amounted to 24% of the March 2012 presidential ballot, the largest voter group after Putin’s. A similar calculation by the Levada Centre for the December 2011 parliamentary election indicates a similarly sized voter bloc against all – 24.6%. The mobilizing effect of the Against-All option, if it were revived, would thus work to the relative advantage of Putin, and to the relative disadvantage of everyone else.